Veterans, National Guard, Reserve Members, Transitioning Service Members, and Military Spouses and Dependents are welcome! Interested in learning how your military experience transfers into the civilian workplace? VA Nebraska-Western Iowa Health Care System Host the STAND DOWN for Homeless Veterans Eligible for Health Care. There is a Project Connect at the same time and place. Project Connect is a one stop event where individuals and families can access a variety of immediate on site support and services. Services such as food and clothing assistance, employment services, homeless services, benefit application support. Vietnam Veterans of America Chapter 18 presents a Vietnam Veterans Day Ceremony. There will be speakers, presentation of the colors, Rifle Salute by the Fremont Honor Guard, reading of the list of names of those killed in action and a ringing of the bells, a rendition of taps, and a rendition of "Amazing Grace" on bagpipes. Take your job search and career in the right direction by attending this event. This event is FREE and open to the public! No registration needed. Please join us for a special proclamation signing and lapel pin presentation ceremony to thank and honor Vietnam veterans and their families for their service and sacrifice. Please contact 402-471-2458 or ndva@nebraska.gov to let us know you'll be attending. As a lasting memento of the nation's gratitude, the Vietnam War Commemoration designed a Vietnam Veteran Lapel Pin for Commemorative Partners to publicly present to each veteran who served during the Vietnam War period. 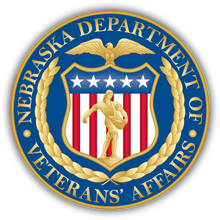 Governor Ricketts, along with the Nebraska Department of Veterans' Affairs and Nebraska National Guard will present pins to eligible veterans at the ceremony. Click here to learn about the Vietnam War Lapel Pin. Please join us at the hearing to show support for LB153, a bill which would exempt 50% of all military retirement pay from being taxed. This would not only increase the amount of the current exemption, but expand the number of people eligible for it, and include the National Guard and Reservists. It would impact over 13,000 Nebraska veterans who receive military retirement pay and make our state more competitive with the states around us, most of which do not tax military retirement pay. When is the race? Our 6th Annual Big Red Challenge will take place on June 8, 2019 in the Railyard (350 Canopy St, Lincoln, NE 68508)!